Next time you need to warn someone about a shark attack or request that they pick up a few fresh avocados from a clown on the way home, no need to do it with words—a new batch of emojis are being released this month. 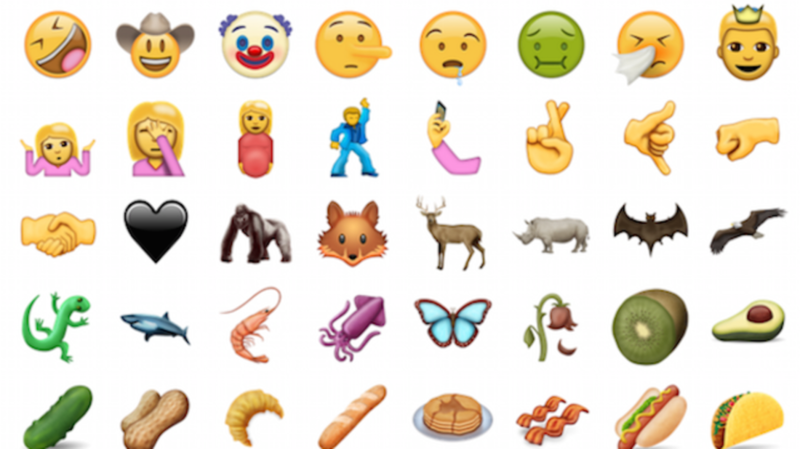 According to SFist, the Unicode Consortium has approved 72 new designs for inclusion in Unicode 9.0, with long-awaited emojis for bacon, face palms, selfies, juggling, black hearts, and even croissants. Unicode notes on its site that the emoji candidate designs for Unicode 9.0 are mockups and that the final designs may vary. Emojipedia showcases each of the new graphics and in many cases, shows how the designs may look on various platforms like Google and emojidex. There is no exact date for the update, but you'll know it's available when your friends start sending baguettes or a pregnant woman in their texts. Check out the Emojipedia mockups below, which include a few rejected designs and a handful from next year's list (fortune cookie! raised eyebrow face! ), then head to the website for more information and individual looks at them all.